On your survey or searches you may have been informed that your new property is in an area that is deemed to be at risk from Radon gas. But what is Radon gas? Radon is a colourless, odourless radioactive gas. It’s formed by the radioactive decay of small amounts of uranium that occur naturally in all rocks and soils. Public Health England (PHE) is the UK’s primary expert on radon and you should refer to their website at www.ukradon.org for more information on the gas. While radioactive material doesn’t sound good, Radon isn’t something to panic about as there are many things that you can do to lower the levels within your home. This is where the lifestyle of the occupant can assist with the build-up of Radon. If a person keeps their windows closed then there would be limited ventilation that will allow the gas to escape the confines of the house therefore causing the levels to increase. As the levels are associated with the way you live, every person would have different levels in their home due to their habits. You can measure the levels of the gas within your home by ordering a test from various sources including Public Health England which you will have to leave for up to 3 months. To get accurate results from the test you should live in your home the way you normally would so that the results are specific to you. Once you have the results you will then be able to explore different options that may be available to you to help lower the levels of gas. This could be as simple as you opening the windows to allow the gas to escape or, for the more extreme levels, having a mechanical ventilation system installed to help remove the gas but these are options that you should explore when you have the results of your test. As more information on Radon gas is obtained, the regulations for newly built properties has adapted which means that if the development is in an area deemed to be high with the gas, the builders will have to incorporate extra ventilation or Radon barriers into the build so that the property has a natural defence against the gas. So, while Radon gas can be harmful if the level is allowed to increase, there are things that you can do that will lower the levels within your home to a safe level. Firstly, you should order yourself a test and see what the results are and then move forward from there with the options available to you. Energy is a big topic at the moment and with energy getting cheaper and easier to use, we as a world are facing consequences for the decades of burning fossil fuel for energy. Because of this, many countries are now looking for ways to reduce the greenhouse gases that they produce. The Climate Change Act (2008), which the UK government is involved in, means that legally the UK is committed to reducing our emissions by 80% from the figures of 1990. The act doesn’t just focus on producing energy but also looks to protect the environment from inefficient use of resources and poor waste management. Because of this, the housing market is under the spotlight as it is the largest single user of energy in the UK. A government paper, The United Kingdom Housing Energy Fact File (2013), estimates that the main culprits for energy consumed by the average UK dwelling is 60% for heating, 21% for hot water and 14% for electrical appliances. The building fabric – This is the physical structure of the building that is designed to protect you from heat, cold, snow, rain, wind and sun as well as provide a suitable indoor environment (humidity, ventilation and lighting). Building services and equipment – The users of the energy, for example the boiler, radiators and thermostats. People – How the occupants use the building, the maintenance and their habits, do they leave the heating on when they don’t need to? For the government to reach their goal of an 80% reduction, these areas will be heavily focused on in the coming years which is why we are seeing an increase in awareness, funding, research and a proactive stance towards reducing energy consumption. When you move into a new home you may not even give a second thought to the energy you use and how you use it but with a little time and effort you could see vast improvements to the amount of energy that you use which in turn could save you money on those bills! Now, that doesn’t mean that everyone should get solar panels on the roof and take cold showers to save on heating water but some small or large changes to the three factors mentioned above could produce some rather comfortable results. There are many online government sources of information that could give you ideas about what could work best for you and your home which you should check out. For further information, or to have a chat about your specific needs and obtain a free quotation, please do not hesitate to contact us. Our friendly team are professional and waiting to hear from you. Contact us using the forms below and we will get back to you straight away. We can advise you in all aspects of property surveys and much more. How serious a problem is Japanese Knotweed? Japanese Knotweed – every homeowner’s worst nightmare. Not only is it virtually indestructible, but most mortgage lenders will refuse to finance a property that has knotweed within seven metres of its walls – meaning that you can never escape. If you’re looking at a property and your HomeBuyer Survey has identified Japanese Knotweed growing in the back garden, how concerned should you be? Let’s take a look. What exactly is Japanese Knotweed? If you haven’t come across it before, it’s important to know that Japanese Knotweed is an invasive species of plant that manages to thrive just about everywhere in the UK. Its aggressive growth (up to 10cm a day) affects the growth of other plants, ultimately causing problems with biodiversity, flood management and property damage. In fact, the species is so pervasive that it is considered an offence to “plant or otherwise cause [Japanese Knotweed] to grow in the wild” under section 14(2) of the Wildlife and Countryside Act 1981. When trying to get rid of the plant, contaminated soil and plant rhizomes (roots) are classed as “controlled waste”, under part 2 of the Environmental Protection Act 1990. It can be hard to identify Japanese Knotweed, and several unrelated plants are often mistaken for it. Key characteristics are light green, shield-shaped leaves, tall, hollow stems that resemble bamboo and can grow up to 3 metres tall, and clusters of tiny white flowers that bloom in upright formations. Thanks to its ability to grow almost anywhere, Japanese Knotweed can be found just about anywhere in the UK. However, the peak of its popularity was during the Victorian period, so properties built around this time are the most likely to suffer from a historic problem with the plant. This plant tracker is a useful tool for identifying how prolific Japanese Knotweed is in your area. The speed and resilience with which this plant grows has been known to cause damage to structures, particularly where weak points are already present. Tarmac, paving, building foundations and retaining walls can all succumb to knotweed in very little time if the plants are left unchecked. However, detailed surveys have concluded that Japanese Knotweed isn’t any more destructive than other plants that are left to grow rampantly. The biggest problem with Japanese Knotweed is that it’s undesirable. It requires constant maintenance to prevent it taking over an entire garden, and is extremely difficult (and therefore expensive) to eradicate entirely. According to the UK government, the cost of controlling existing Japanese Knotweed had risen to £1.25 billion in 2014. 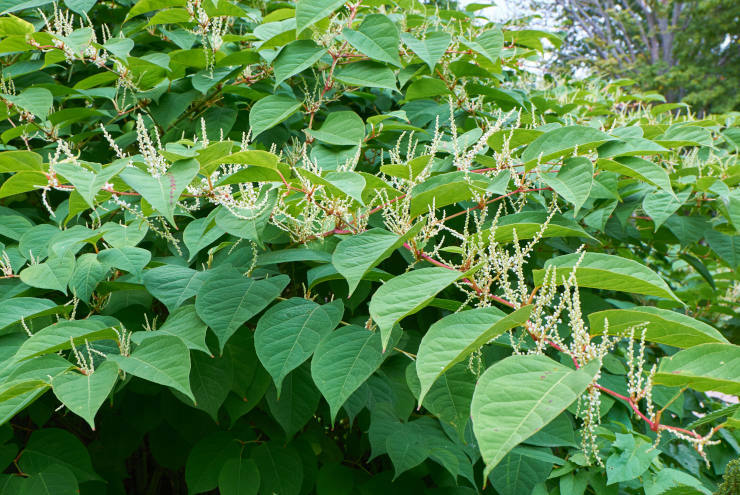 Ultimately, although you may want to steer clear of properties that have been diagnosed with Japanese Knotweed in the garden, it does not have to be a deal-breaker if you have already fallen for the house. Your best bet is to speak to an experienced surveyor and arrange for a Building Survey or specialist report to help you understand the potential implications if you proceed with the purchase. 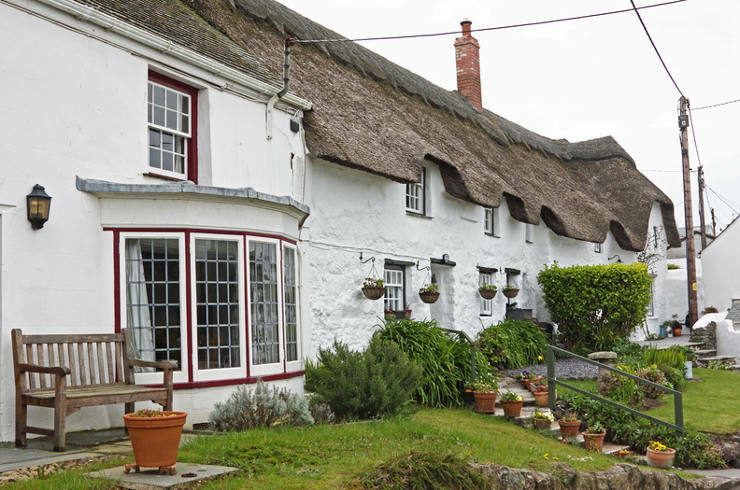 If you have ever lived in Cornwall or tried to buy property there, you may have come across the term “mundic block”. It refers to a historic building material that was particularly popular in Cornwall between around 1900-1950 1952, which used waste materials from nearby mines as a concrete aggregate (“mundic” is simply the Cornish word for mine waste). It was fairly common in those times for concrete to be mixed locally, using the materials that were at hand. This resulted in a large number of Cornish homes being constructed from this ‘mundic’ material. The issue with mundic block is that it’s difficult to predict what exactly is in the mixture. Quite often, due to the high mineral content of the Cornish soil and the ore extraction process, the aggregate still contains minerals or chemicals that actually cause the concrete to degrade over time. Needless to say, this can have a considerable impact on property values, with many buyers trying to avoid houses that have been built with mundic and lenders refusing mortgages for properties of a certain condition. How can you tell if a house is built with mundic block? It may be obvious that a building has been made with mundic materials or it may be uncovered during a Building Survey. Regardless, in Cornwall and West Devon, any property that has been built (or altered) between 1900 and 1960 and contains concrete or concrete block will need to be tested for mundic. Many surveyors offer a Mundic Test to screen concrete building materials, or can arrange for one to be carried out on your behalf. This test involves taking small samples of the house’s fabric using a drill, which are then analysed for mineral content and given a grade of A1, A2, A3, B and C.
An A1 or A2 grade is good news. That means that the concrete doesn’t contain any potentially harmful materials or contains so few that there are unlikely to be future problems as a result. Nearly all mortgage lenders consider this to be an acceptable grade to lend against. If a sample contains more than these levels of mundic, it may be classed as a grade A3. However, special testing is required to obtain this grade (rather than a grade B), and the testing is expensive, time-consuming, not appropriate for every case and may still be denied by mortgage lenders. You will not secure a mortgage if the property is classed as a B or C on a mundic test. This means that mundic makes up more than 30% of the concrete and may already be causing visible degradation. However, if the mundic is limited to a specific part of the property, you may be able to replace it with a modern material in order to obtain lending. For more information about mundic block, Cornish homes or surveying services across the country, please get in touch. Summer is finally here, and the warmer weather means it’s the perfect time to get outside the house and enjoy the garden… It also means that it’s a great time to tackle those important home maintenance jobs that you’ve been putting off with the excuse of bad weather. Completing a few simple jobs is all it takes to keep most homes in good condition, with work on the outside benefiting the inside in many cases, too. Whether you’re hoping to impress prospective buyers when you put your house on the market this summer or simply want to enjoy a clean home for yourself, here are six essentials for keeping it at it’s best. Your home sees a lot of wear and tear over winter months, with fluctuating temperatures and adverse weather conditions taking their toll on walls and roofs. On a clear, bright day it’s sensible to walk around the perimeter of the house and look for cracks, loose tiles or other signs of damage that have appeared or been exacerbated over the last few months – repairing these should be a priority. Remember, if you are particularly concerned about any damage, a surveyor will be able to investigate the extent of the problem and help you determine the best course of action for remedial work. Wind and rain inevitably leave a layer of grime on your windows, which you might not even notice until the sun starts trying to shine through again. Grab a bucket of soapy water, a large sponge and squeegee for a sparkling finish. This is the perfect opportunity to check that your window frames, lintels and sills all seem to be in a good condition – a blown seal or rotten timbers will be much easier to address in good weather. 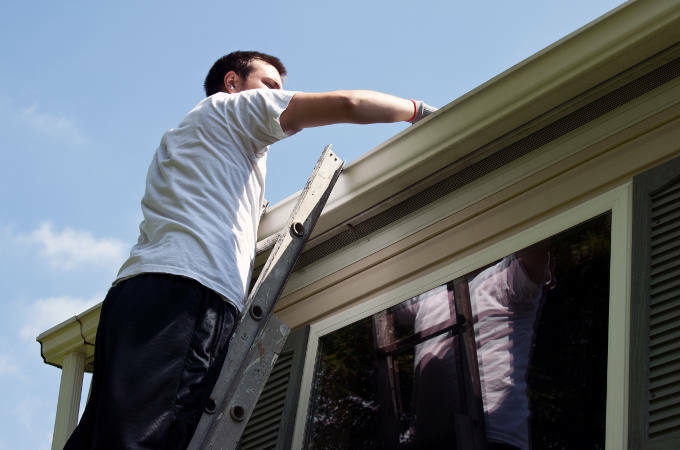 While your ladder is to hand, it’s time to clear out your gutters and scrape your roof. A build-up of moss, twigs and other debris can trap moisture and allow damp to penetrate into your building, which will be much more unpleasant to deal with than simply emptying out your rainwater goods a few times a year. Over time, paved areas get grubby and covered in moss, which leaves them looking distinctly unloved. Renting a pressure washer for a weekend is the quickest way to get patios, driveways and paths looking shiny and new again. Depending on the material of your house, you may even be able to use the pressure washer to get your outer walls looking fresh, too – just make sure you’ve repaired any cracks first. Once it’s dry, touch up the paintwork and give your front door a wipe down too. Another aspect of your home that’s easy to forget is its ventilation. Use a duster or vacuum cleaner to keep indoor extractor fans working efficiently and find a thin tool to clear cobwebs out of air bricks. This is another important job for keeping the inside free of damp and mould, allowing fresh air to circulate between walls and floors. If you are planning to sell your property this year, we would recommend getting a survey to make sure the winter months haven’t caused any hidden damage that could deter a potential buyer. Whether your home is nearly new or hundreds of years old, having a report confirming that everything is working properly (or warning you if it isn’t) provides you with a realistic expectation of what a buyer sees when they come to view. For more information about our surveys, or if you have any questions, please give our team a call and we will be happy to help.